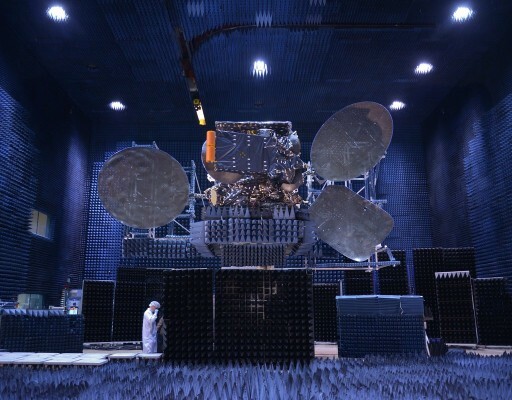 Intelsat 34 is a commercial communications satellite built by Space Systems/Loral for operation by Intelsat of Luxembourg to deliver media services to customers in Latin America and to provide broadband communications for aeronautical companies servicing the North Atlantic Routes. The spacecraft carries a hybrid C- and Ku-Band payload to deliver flexible communications services. The Intelsat 34 satellite is the replacement for Intelsat 27 that was lost in early 2013 when its Zenit-3SL launch vehicle failed just seconds after liftoff from its ocean-based launch platform, impacting in the Pacific. The satellite does not carry a UHF hosted payload for military operation since Intelsat was unable to market this particular system to U.S. military customers. The satellite is based on SS/L’s well proven LS-1300 satellite bus that is capable of hosting powerful communications payloads with high power demands. Intelsat 34 has a launch mass of 3,300 Kilograms and measures 5.6 by 3.5 by 3.0 meters in size when in its stowed launch configuration. Its empty mass is 1,800 Kilograms. Intelsat 34 uses the low-power variant of LS-1300, featuring two three-panel solar arrays that deliver over 10kW of power to a dedicated system that conditions the satellite’s power bus and controls the state of charge of the vehicle’s batteries. Three-axis stabilization and navigation is accomplished by state of the art navigation sensors and reaction wheels. The satellite is equipped with a chemical propulsion system for orbit-raising and stationkeeping using a main apogee engine and a series of attitude control thrusters. The main propulsion system is centered around the R-4D-11 engine. The R-4D engine is a Monomethylhydrazine/Nitrogen Tetroxide Engine that provides 490 Newtons of thrust. The engine is 0.55 meters long and 0.28 meters in diameter with an unfueled mass of 3.63 kilograms. The engine provides a specific impulse of 312s, has a thrust to weight ratio of 13.7 and operates at a chamber pressure of 6.9 bar. The original RD-4 was developed as an attitude control thruster for the Apollo Service and Lunar Lander modules. 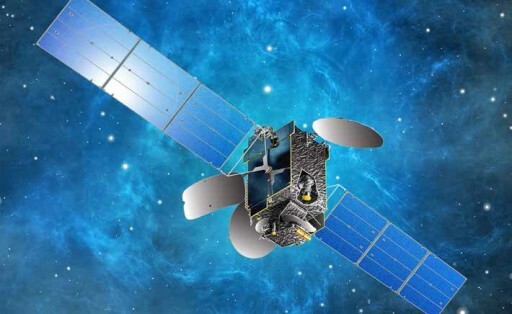 Intelsat 34 also sports an electrical propulsion system for stationkeeping maneuvers in Geostationary Orbit, offering a prolonged satellite life given savings in chemical propellants. Four SPT-100 Stationary Plasma Thrusters are installed on the satellite each delivering a nominal thrust of 83 Millinewtons. The Intelsat 34 Satellite features a hybrid satellite payload consisting of 24 C-Band transponders and 24 Ku-Band transponders. The C-Band channels deliver services across a large area including North and South America and Europe while the Ku-Band transponders deliver spot beam coverage to Mexico, Central America, Brazil, the Caribbean, Europe and parts of the United States. The Intelsat 34 spacecraft will complete its In-Orbit Testing Campaign at 51.1°W in Geostationary Orbit before moving over to 56°W where it will replace the Galaxy 11 and Intelsat 805 satellites. The operational life of Intelsat 34 is expected to exceed 15 years.